A photovoltaic (PV) solar system is comprised of solar panels, racking, and an inverter. From sunrise to sunset, the solar panels generate electricity (DC) which is sent to an inverter. The inverter converts the DC electricity into alternating current (AC). The AC power is delivered directly to your home’s main electrical service panel and the over production is sent to the utility for future use. The grid acts as your battery bank, supplying power to your home when the solar doesn’t and saving electricity when solar is producing. Ocean Solar designs solar systems to cover 100% of your yearly consumption. Shading could be a problem if you have trees shading your array or other structures. The beauty of Ocean Solar’s inverters is that we can design around shading providing optimal sun hours! In NJ, when you Own Your Solar® you increase your home’s value without increasing your property tax…its the law! Your energy use and the size of your solar energy system will determine your actual savings amount. Our goal, providing you have enough roof or land space, is to cover 100% of your electric bill, reducing it to $0 through ownership. A typical return on investment is usually about 15-20-25% ROI. By How Much Does Solar Increase Your Property’s Value? Solar homes appreciated 17%, and sold 20% faster on average than the non-solar homes, according to a recent study by the (NREL) National Renewable Energy Laboratory. In fact, a recent study estimates that purchasing solar can increase the resale value of your home by more than $5,000 per kilowatt added. 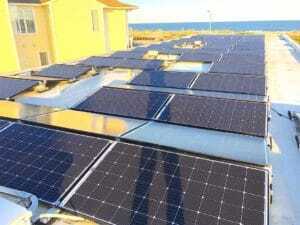 How much will a Ocean Solar® solar system for my home cost? The cost of your solar system depends on several factors including: your current energy usage, your available unshaded roof space, your utility’s net metering policy and other factors. Financing solar has never been easier. Are Ocean Solar’s systems better than others? In short, YES! Ocean Solar only uses American made equipment and only installs the highest efficiency solar panels on the market today. We also uniquely design your solar for your location. We also do not over build your system so that you are paying for a system that over shoots your utility bill. You can rest easy knowing that Ocean Solar has your back!